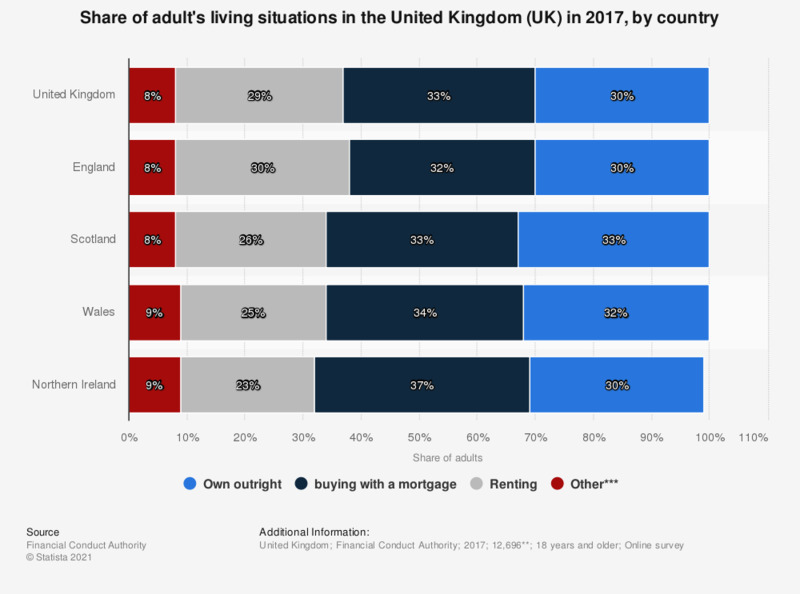 This statistic displays the share of adult's living situations in the Untied Kingdom (UK) in 2017, by country. As can be seen from the data, England had the highest share of renters of any country in the UK at 30 percent. Northern Ireland had the highest share of adults that were buying with a mortgage. * This question was phrased by the source as follows: "Which of the following best describes how you occupy the property you currently live in?" ** Base: All UK adults (unweighted 12,696/weighted: 12,690), excluding ‘don’t know’ responses (1%). *** : ‘Other’ category includes living rent-free (including in relative’s or friend’s property, excluding squatting) (7% of all UK adults), sheltered accommodation (1%), comes with the job (<0.5%), and occupy it in another way (<0.5%).